Creator of the MOHAN VEENA and the winner of the GRAMMY AWARD, Vishwa Mohan has mesmerized the world with his pristine pure, delicate yet fiery music. It is due to Vishwa's maiden mega effort that he rechristened guitar as MOHAN VEENA, his genius creation and has established it at the top most level in the mainstream of Indian Classical Music scenario, thereby proving the essence of his name VISHWA (meaning the world) and MOHAN (meaning charmer) and indeed , a world charmer he is. Being the foremost disciple of Pt. Ravi Shankar, Vishwa Mohan belongs to that elite body of musicians which traces its origin to the Moughal emperor Akbar's court musician TANSEN and his guru the Hindu Mystic Swami Haridas. 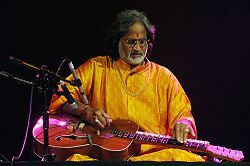 Vishwa Mohan Bhatt has attracted international attention by his successful indianisation of the western Hawaiian guitar with his perfect assimilation of sitar, sarod & veena techniques, by giving it a evolutionary design & shape and by adding 14 more strings helping him to establish the instrument MOHAN VEENA to unbelievable heights. With blinding speed and faultless legato, Bhatt is undoubtedly one of the most expressive, versatile and greatest slide player s in the world. captivates the audience whether in the United States of America, Europe, Gulf countries or his motherland India. Vishwa Mohan has become the cultural ambassador of India by carrying the Herculean task of glorifying and popularizing Indian culture and music throughout the world.Outstanding features of Bhatt's baaj (style) are his natural ability to play the 'Tantrakari Ang' and incorporate the 'Gayaki Ang' on Mohan Veena which is the greatest advantage of this instrument over traditional Indian instrument like sitar, sarod and veena. It was no surprise that Vishwa Mohan with his sheer virtuosity and limitless supply of melodies won the highest music award of the world, the GRAMMY AWARD IN 1994 along with Ry Cooder for their World Music Album, 'A MEETING BY THE RIVER' enhancing his celebrity status not only as a star performer but also as an improviser and a soulful composer. Vishwa Mohan has performed extensively in the USA, USSR, Canada, the Great Britain, Germany, Spain, France, Italy, Netherlands, Belgium, Scotland, Switzerland, Denmark, then scaling the Gulf of Dubai, Al-Sharjah, Bahrain, Muscat, Abu Dhabi etc. and throughout India. Indian stringed instruments have undergone many changes throughout history . Many western musical instruments like violin, harmonium, mandolin, archtop guitar and electric guitar have come to be accepted in Indian classical music. Vishwa Mohan Bhatt developed and named this hybrid slide guitar and has been added to the list of Indian classical instrument.The Mohan Veena is a highly modified concord archtop, which Bhatt plays lap-style. It has 19 strings: three melody strings and four three drone strings coming out of the peg heads, and 12 sympathetic strong to tuners mounted to a piece of wood added to the side of the neck. The melody strings are on what we would consider the treble side of the neck, and the drone strings are on the bass side. The drone strings are lower in height than the melody strings to allow for unrestricted playing of the melody strings. The sympathetic strings run underneath the melody and drone strings to yet another level in the bridge. The instrument has a carved spruced top, mahogany back and sides, a mahogany neck, and a flat, fretless, rosewood fingerboard. The Mohan Veena is under tremendous tension; the total strings pull to be in excess of 500 pounds. It is due to this high tension the tone tuns incredible with the sympathetic ringing out and strengthening each note played. This is a loud instrument made to cut through with low amplification.